Home DIY Projects	Convert a Pickle Jar into a Treat Jar for your Pets! I reluctantly admit I’m a hoarder. I even save empty glass jars. I do in fact use them, which is a GOOD thing! A few years ago at Christmas I made cute little treat jars for a few of my pup Lacey’s doggie friends. So cute and simple! The lids are the easy part! I have a stash of small knobs from other projects. (Of course I save those too) I glued a small knob on top of the jar with E6000 glue and let it dry. Then, I spray painted the lid and the knob. I painted this one with a black satin spray paint. 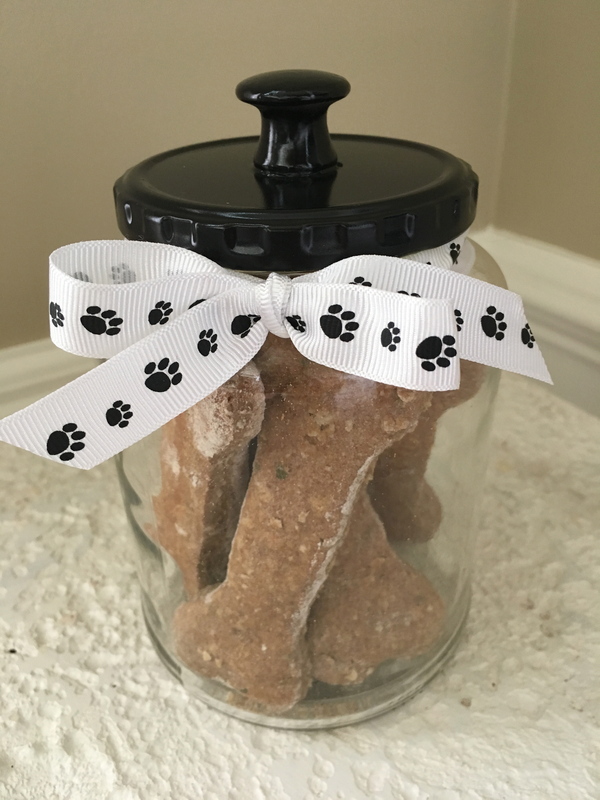 I tied a thin ribbon with dog footprints around the neck of the jar and filled it with my homemade dog treats. (see the recipe for dog treats on the blog) So cute and easy. And inexpensive! These make great gifts. Personalize the jars and/or treats by making your own gift tags too! You can fill them with people treats too and give them to your favorite teacher or neighbor. Thanks for stopping by! Check out part two of this post HERE for more applications of the treat jars. I happen to do similar projects quite often (remember I am kind of a hoarder!) and I wanted to share a couple of the super cute ones with you; Candy Jar, Easy Halloween Craft, Kids Snack Dispenser, & Parmesan Cheese Lids. Lastly, in case some of you do not have this stuff laying around the house or in Craft Closets like me, I took the time to find some cheap and easy options from Amazon listed below. I love Amazon!! Really great idea. I reuse just about everything so I get it. Great craft idea for a fair. I help an organization with pet rescues and this would be great to sell.